THE SECRET TO PERFECT EYES! 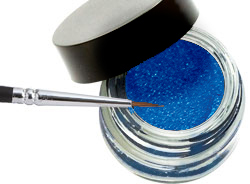 Indelible Gel Eyeliner by Blue Water Naturals! Create the prefect eye line with this waterproof gel eyeliner. No streaks, no smudge, no mess - just slim, sophisticated, eye-enhancing expert lines. Normally only available in salons, you can order direct from Blue Water Naturals! Defining your eyes with eyeliner will immediately enhance your look and draw attention to the beauty of your eyes. Apply with sable brush for the perfect line. Line and define better than ever before. This highly pigmented eyeliner features a waterproof, fast-drying formula that&apos;s made to last! Keep eyeliner on all day long with this special anti-oxidant enriched formula. EU Compliant and Hypo-Allergenic for sensitive eyes.